Note: You're in the right thread if you have a new question about Sony Vegas. If you just want to browse the answers and other tutorials already written in this thread, please see the Sony Vegas All-In-One Help Thread. Again, if you have a new question, please post it here in this thread. 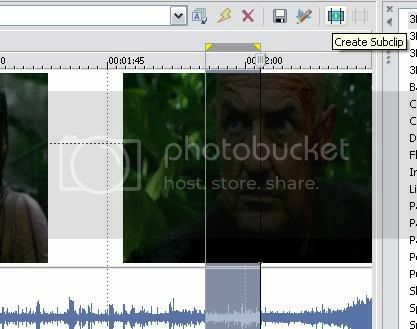 The first thing you will need to do to start your video is import the clips or episodes of Lost. Unfortunately Vegas doesn't like avis too much but there is a way around having Vegas crash on you when importing avis. 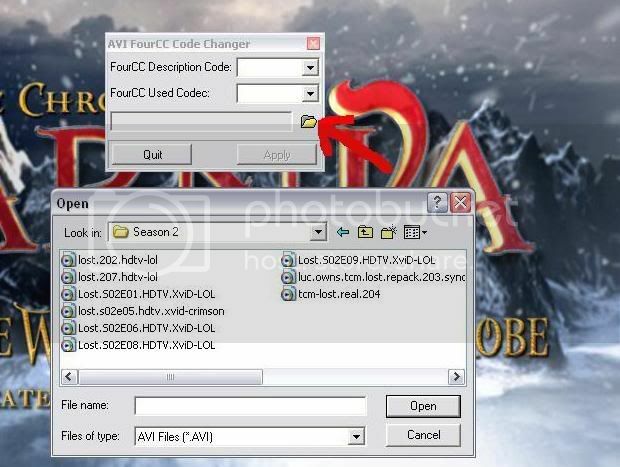 That is by changing the FourCC Code of the avi files. Extract the zip file and run the program. Open up your avi file using the explorer button in the program and enter "DIVX" in both boxes. Click apply and your avi file should now be able to be imported into Vegas. Alternatively you can encode the avis to a high end MPEG or WMV format. 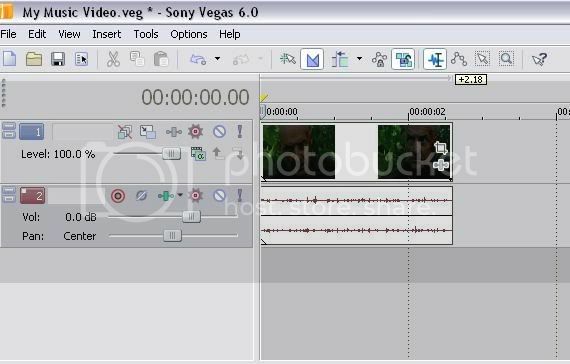 This is the tool you will use in Vegas to cut clips out you want to use from the movie files. 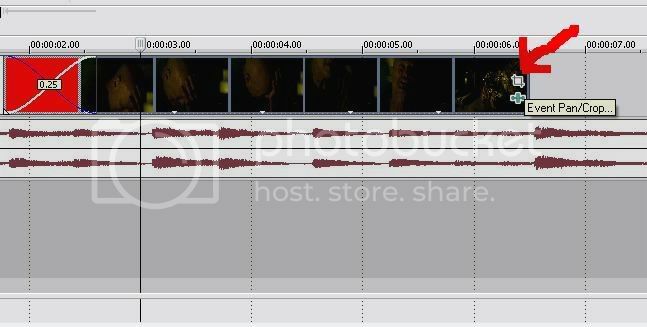 Right click on the episode/clip you want to edit and click "Open in Trimmer." Hold down the left mouse button and drag it along and you can highlight a section of the space on the trimmer. Zoom in and out by using the mouse wheel. You can preview the selected clip in the preview window by using the play functions at the bottom of the trimmer. Once you're satisfied click the Create Subclip button (see pic) and name it if you want. Your clip has now been added to the project media tab. At the top of the screen there is a timeline which is where you edit your video. Select the clip you just made and place it onto the timeline. You have created two layers. The top one is the video and the bottom is the audio. I will get rid of the audio layer as when making a music video you shouldn't usually need the sound from an episode. Add your song underneath the video clip and it will come up as an audio layer. Notice how the clip looks rather dark in the small window. Let's brigten it up! Select the Video effects tab and the Brightness and Contrast Video effect. Change the setting of the preview window from draft to preview so that you get a better idea of how it will look. Change the brightness and contrast levels until you are happy with it. When you have a few clips in order on the timeline you will probably want to add some transitions to make your video flow better or to highlight a beat in the song etc. Click on the transitions tab. The most common type of transitons are Cross-Fade, Linear Wipe and Flash. 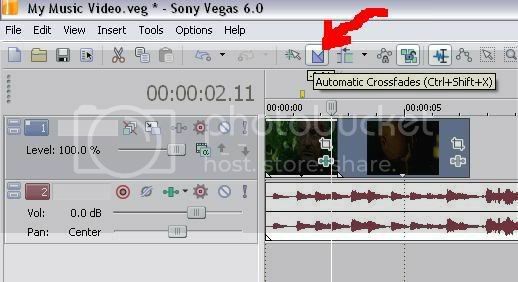 Cross Fade will let you fade between different clips or fade into/from black. This is the generic transition in Vegas and doesn't appear in the transitions tab. Linear wipe lets you wipe away a particular scene onto another one from any angle. Flash is very useful to highlight an important beat in the song. Hold down the left mouse button on the clip and drag it along over the clip you want to create a transtion with. This will have created the generic cross fade transition. You can replace it with any other transition if you want and it wil stay the same length you selected. Move the cursor over the bottom of the square and hold the left mouse button down and drag it towards you and from you to zoom in and out. You can also rotate the clip by selecting the corners of the square and moving it around. You can pan across the clip by selecting the middle of the square and moving it around. Speeding up and slowing down: The easist way to speed up and slow down a clip is to hold down ctrl when dragging a clip to extend or shorten it. Splitting Clips: Pressing 's' will split a clip in two. Awesome! Just what the new Vegas user needs! I added it into the text guides section already. I'm one of those sado-masochists (sp?) who converted all his lost eps to 2 meg WMVS Yeah I don't think audio works with avi files. I used a wmv episode for the tutorial cause it was easier. LOL oh okay. How long did that take to convert them all btw? On my desktop it takes me around an hour and a half per episode to encode it. Wow, that's a life saver, Paul! I'm a Vegas newbie so I'm still trying to figure things out. I do have a question, though: How do you creat the effect where you have 2 clips overlapping but faded together. Like if someone was having a thought bubble and I wanted to show the other person on the side of the screen. Nevermind! I figured it out all by my onesies. Haha go you. Yeah I tried to keep the tutorial as basic as possible so I didn't want to get into overlapping videos but yeah you just create a new video track on top of the original and you pan out and use cookie cutter to cut out any edges and such. This tut is awesome Pauly, wow! Great Job. Now if only this was around back when I first got my Vegas 6. Took me friggin' forever to figure out how to use it. lol. How do you make 2 videos play at once, like in ordinary world, by polar bear, where like one is on one side and the other is on the other side, but they dont like fade in they just play together? You will need to make two video lines one on top of the other. Then you need to put cookie cutter on the one you want to manipulate and you can cut out a part of the vid with a shape like a circle or an oval or multiple shapes so you can cut out the background. 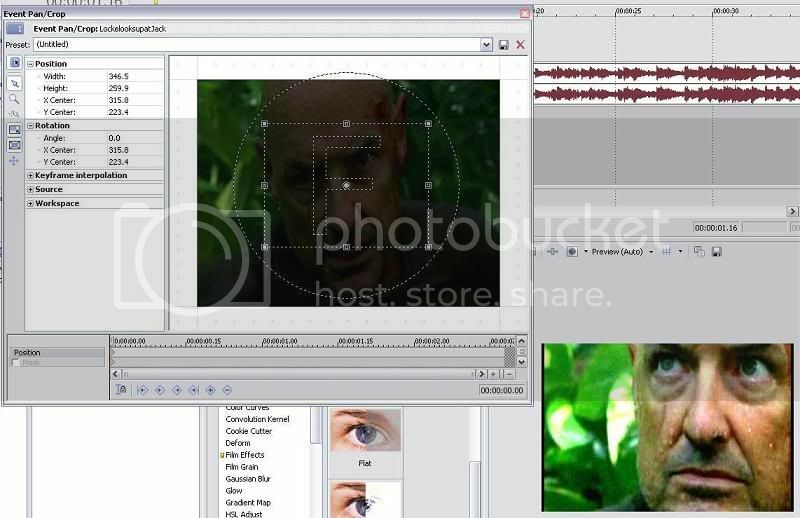 Altenatively you can just make them split screen by using the square shape and moving it across so it creates a line down one of the sides of the clips and then to resize it its best to use a lil button on the video line toolbar. I forgot what its called now but it lets you move and resize the whole video timeline. Wow, thank you SO MUCH for this tutorial!!!! I only just got Vegas 6 and even though it looks *exactly* like the program I was using before, there's just so many new stuff on this that I got lost pretty easy there. Also thanks for the avi help! I'm gonna try this now. I sure hope it works! Thanks again! okay so i'm using sony vegas right now and i'm really happy with what it did with my video. but now whenever i try to save the video it saves it as an sfk file, which doesn't play on windows media player and i can't upload it onto any of the websites...do you know how to make it a wmv file or something else that will actually play? i'm at my wit's end!